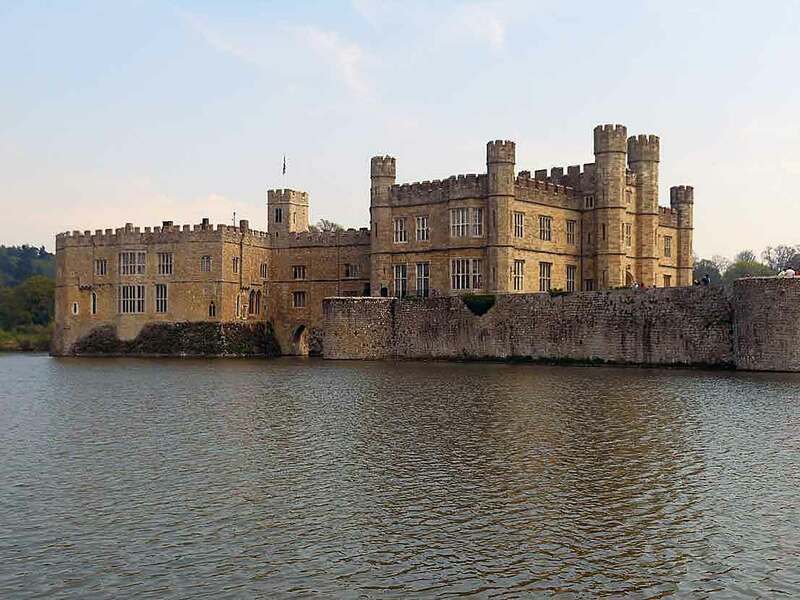 Leeds Castle has been linked with a number of royal love-affairs, most notably that of Henry VIII and Anne Boleyn. But there is another tale – less well-known, but equally poignant. The marriage of Henry V’s brother, Duke Humphrey of Gloucester and his wife, Eleanor of Cobham was a love-match doomed to failure. Their story features as a secondary theme in the recent Hollow Crown series of Shakespeare’s historical plays and is worthy of a plot-line in Game of Thrones. Eleanor of Cobham was born at Sterborough Castle, near Lingfield c. 1400. The daughter of a knight, she was of respectable, but lowly, birth. Described as beautiful, intelligent and ambitious, Eleanor caught the eye of Duke Humphrey when she joined the entourage of his wife. She became Humphrey’s mistress, then his wife, after his first marriage was annulled. From humble origins, Eleanor had ascended into the social stratosphere. Duke Humphrey was the younger brother of warrior-king, Henry V, who died unexpectedly leaving an infant son (later Henry VI). Humphrey lost no time in assuming the mantle of regent with all its attendant powers. With Eleanor, he established his own, splendid court and was a patron of the arts. He also enriched himself and his followers with royal lands which, if he died first, would revert, not to the Crown, but to Eleanor. Moreover, if the child-king died, Humphrey would succeed to the throne and Eleanor would be his queen. The long regency proved fatal to the stability of England. Court and country were torn apart by aristocratic in-fighting as noble families jostled for power. Humphrey headed a group that wished to pursue war with France; but he was opposed by an equally powerful faction which favoured peace. As the young king approached adulthood, Humphrey’s hold on power became more tenuous. Eleanor – the woman he had married for love – was his Achilles heel. Possibly driven by her husband’s growing insecurity, Eleanor consulted two astrologers, requiring them to draw up a horoscope for the youthful king with a view to predicting her own fortunes. Unfortunately, the astrologers predicted that the king would soon fall seriously ill. Rumours began to spread until finally, they reached the court. The astrologers were arrested and charged with necromancy and heresy. The instruments of their trade were “openly showed to all men at the Cross” in St Paul’s churchyard upon a purpose-built scaffold along with one of the accused, Roger Bolingbroke. Terrified, Eleanor sought sanctuary at Westminster before fleeing to the castle at Lesnes, near Erith. When questioned, Bolingbroke named Eleanor as the instigator of a treasonous plot. Her innocent pursuit of a horoscope was swiftly translated into a conspiracy to poison the king and she was incarcerated at Leeds Castle. Her terror can only be imagined as, friendless and alone, stripped of power and deprived of the companionship of her husband, she awaited trial. Potentially, necromancy, heresy or treason meant execution – and some methods were even more terrible than others. Just 40 years previously, a new statute had introduced death at the stake for heretics. At trial, Eleanor protested her innocence. While admitting that she had procured various potions from Margery Jourdemayne (the witch of Eye), she insisted that these were only to help her conceive a child. Yet she was unable to save her associates. Margery was burned at Smithfield; Bolingbroke was hanged, drawn and quartered at Tyburn and Eleanor’s chaplain, one of the two astrologers, “died in the Tower for sorrow”. While Eleanor escaped with her life, her enemies were bent on revenge. She was forcibly divorced from Humphrey and made to do public penance, walking bare-footed and carrying a lighted taper through London to pray at various churches. She was then condemned to life-long imprisonment, being moved around the country from one remote gaol to another until she died, lonely and forgotten, eleven years later. As for Humphrey, although a loyal servant of the Crown, he was charged with treason. He died while awaiting trial, probably from a stroke although many, including Shakespeare, believed his death to have been due to more sinister forces; a murder arranged by his political enemies. Click here for my previous blog ‘The Devil’s Advocate? Witches vs The Law’ for more on Eleanor and Queen Joan of Navarre who was also accused of witchcraft. This entry was posted in Castles, Eleanor of Cobham, Henry V, Henry VI, History, Kent, Leeds Castle, Plantagenets, Shakespeare, Wars of the Roses, Witches and tagged Game of Thrones, Plantagenets, Shakespeare, The Hollow Crown, Wars of the Roses. Bookmark the permalink.